Hana first came across Yoga during her dance training. Throughout her professional career in dance, her practice of Yoga supported her and kept her sane and balanced during challenging times. Yoga eventually became a passion and her knowledge and experience of the physical and emotional body through dance eventually became intertwined with her practice and teaching of Yoga. She continued to take several teacher training diplomas in India and UK including Sivananda, BWY, Satyananda (Yoga Nidra) and Pregnancy, Postnatal Yoga, Well Woman Yoga Therapy with Birthlight and Uma Dinsmore Tuli. Hana has 13 years experience of teaching Yoga and dance. She is BWY foundation course tutor and a Senior Yoga teacher with Yoga Alliance. Many of her students have continued on to becoming successful Yoga instructors and dance students moving on to a profession in dance. Watching her students and clients grow and enjoy their practice is an absolute honour. She is eternally grateful to all her teachers and students, past and present that have taught her so much. She looks forwards to meeting you in class! 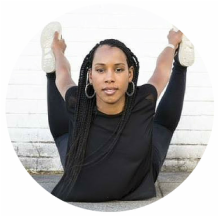 Coming from a professional dance background, Simone has experience in a variety of dance forms, martial arts and teaching, her yoga practice grew alongside her dancing life. She discovered Yoga during her full time dance training at The Northern School of Contemporary Dance but the seed taking care of her health, wellness and awareness was sewn from a very early age in life. 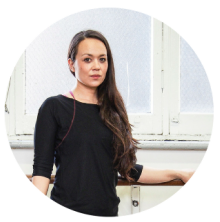 Whilst training in dance in New York, she discovered Bikram Yoga and then continued to practice at Michele Pernetta’s studios in London, to support her mentally and physically during her dancing career. After leaving her last full time dance position, she explored and practiced different forms and aspects of yoga further and began to focus on yoga as a lifestyle, enabling her to maintain optimum health, physical condition and wellbeing. She now enjoys the balance of yoga, dance and teaching, which all work well with her passion for traveling. Simone is grateful to be on a journey of joy, health, wellness, looks forward to embracing everyone who will be joining her. Rhian has been practising yoga for nearly 20 years and has been teaching since 2008. Her mother as well as her maternal grandmother practised yoga and she is grateful for this influence. Her classes include a focus on the breath, movement and flow and are often concluded with a blissful guided relaxation. Rhian believes that Yoga can be an accessible and life enhancing experience for all and encourages students to listen to their bodies. Becoming a Mum naturally opened Rhian’s love of yoga and her teaching to a softer, more feminine and expansive style and after having her daughter at home, Rhian became aware of the teachings of Uma Dinsmore-Tuli. Rhian trained with her to be a pregnancy yoga teacher and she continues to be inspired by the guidance of Uma. Before having her daughter Rhian practised Art Psychotherapy alongside yoga. She also has an ITEC diploma in massage and is a trained reiki healer. Rhian looks forward to warmly welcoming you to her classes. The biggest impact Yoga had for Zainab was a total turn around in mental positivity and a control over the negative thoughts not to mention a loss of sciatica in her back. Having a very active mind and busy lifestyle yoga introduced her to stillness and balance allowing day to day activities to become easier and more effortless. After many years of committed practice, Zainab trained in the south of India gaining a teaching certificate in Hatha Yoga. Zainab is a patient and encouraging yoga teacher. Whether you are recovering from an injury, looking to achieve a headstand or would simply like to still the noise in the mind she will help get you to your goal, bringing more unity with yourself along the way. Zainab seeks to educate students in how to practice safely and properly allowing you to take your Yoga practice with you where ever you go. She is delighted to share Yoga with you as a valuable tool to enhance health and wellbeing in your life. Izabela comes from a background of physiotherapy which eventually drew her to becoming a Yoga instructor. Izabela maintains a dedicated practice in the tradition of Radajdiraja Yoga a classical and ancient style. Izabela believes that Yoga is more than practice, and for her its a way of life. During her classes she likes to keep the atmosphere relaxed, yet energised, working on the essential mind and body connection. Expect Mindful Vinyasa Flow that will get you out of your head and into your body, bringing about a sense of harmony and happiness from within. Almon has been practicing yoga since her early twenties. Almon’s classes bring strength and flexibility to body and mind. Accessible to all levels, the focus is on breath-based yoga movement, safe alignment and mindfulness. Almon was drawn to yoga whilst working as a busy professional amid the freneticism of London life. Her yoga practice has been a natural anchor through many of life’s inevitable ups and downs. In particular, she found yoga postures and visualisation to be a great help during pregnancy and the early days of being a mum to her son Rio, who is now a yoga enthusiast himself. She is qualified in Max Strom’s 200 Hour Inner Axis (Hatha) Teacher Training, Yoga Alliance Pregnancy & Postnatal Yoga Teacher Training and Birthlight Baby Yoga Levels 1 & 2. Almon is grateful to all her teachers for their guidance and looks forward to sharing her knowledge with Mindful Movements students.